Time to post dates for 2019. How much different is it to sports sedans that was made public weeks ago? I actually don’t know, they may or may not run the same rounds as we do. I think we are doing 5 of the 8 rounds, I think they are doing 6 rounds, obviously some of theirs will be the same as ours, but some won’t. Plus we have 2 categories (U2L and O2L) and they always run 2 day race meetings and we are looking at maybe one 1 day race meeting. To achieve that we would need 2 categories to agree to do the other day. I think we are also avoiding the last round to maximise the potential to goes to the Nationals. Plus Bathurst at the start of the season. All up ours looks to be a bit more complex than theirs, so taking longer. I am of the understanding that SA dates are still to be approved by State council, hence no announcements as yet. No Bruce, that’s not what I’m saying. 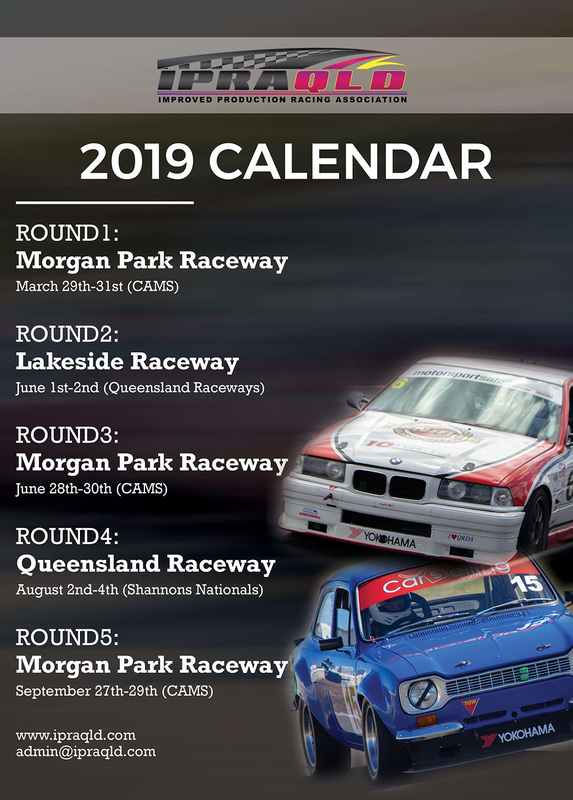 Maybe Sports Sedans are willing to publish a calendar that may change and we aren’t. Until it’s finalised that’s possible, plus ours is more complex and requires cooperation from other categories and the promoters. Which I tried to explain above. Meeting finished just arrived home, IPRANSW calendar hot off the press. How many of these rounds are combined unders and overs? TwinTurbo wrote: posting on here about it will achieve exactly nothing. After that we will have some many entries it would have been impossible to combine grids. Nice poster by the QLD team! Why no promotion of the "state of origin" theme of round 3? I thought it would bring bigger fields knowing you should get an additional 10 cars (hopefully more!) from NSW?? "Conversely some people lack self awareness / emotional intelligence, and just have to be right all the time... "
There was some talk of "race " meetings being canned for 2019 at Lakeside due to noise and grumpy neighbours. Any news on this?? Might be an opportunity to do Lakeside and Morgan Park together if the car hangs together. Last edited by Born Again Racer on Wed Dec 12, 2018 3:24 pm, edited 1 time in total.